In the spirit of ﻿yesterday's holiday, I wanted to share with you one of the books I am using to teach American history to my kindergartner and 2nd grader. 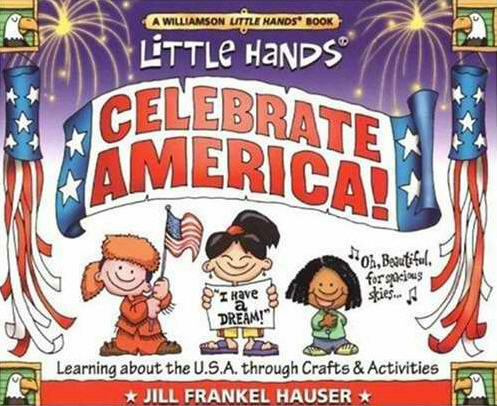 Little Hands® Celebrate America! is such a fun book for introducing young children to our nation's history. 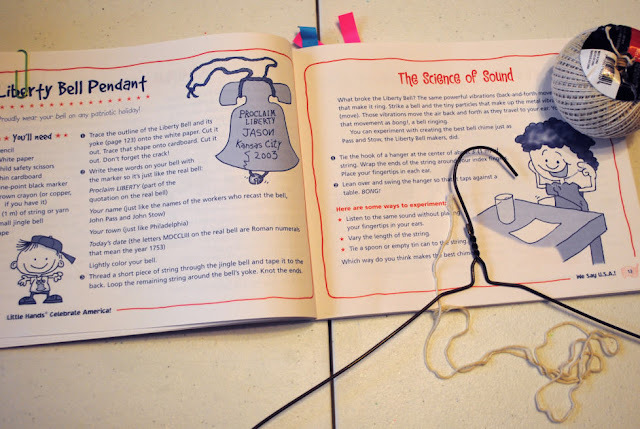 Inside these pages, parents and teachers will find a short - but informative! - story (description) of the symbols, history, geography, and heritage of our country. For each topic, there is also an accompanying craft or game. For instance, at the beginning, Hauser talks about the U. S. flag and the symbolism behind each element. Children can create their own personal flags with a picture of themselves in the blue square, and/or design their own American flag using stars, stripes, and the colors red, white, and blue. As you go through this book with your students they will learn to identify famous American landmarks, memorize patriotic songs and poems (America the Beautiful, etc. ), discover famous Americans (Lewis & Clark, Sacagawea, Martin Luther King, Jr., Tecumseh, etc. ), and learn about our national holidays. Along the way they'll make a freedom drum, a cornucopia, a Navajo bracelet, a suspension bridge, and many, many other fun crafts. This is simply the best book for young, children. I have been using it as the core, and supplementing it with books I purchased on Etsy and Amazon, as well as some from our local library. I've also been using printables that I've found online (check out my Pinterest page). This book is available in English only. So if you are looking for a great little book to teach your K-5th grade child about American history, this one's for you! You can find new and gently used copies in my online store. Disclosure: I purchased this book for my kids' lessons. I was not contact in any way by the publisher.